As a result of the US elections, five Indian Americans were elected to the US Congress. Kamala Harris is the daughter of an Indian mother who emigrated from Chennai in 1960 and a Jamaican American father. She is a two-term attorney general from California, and created history by winning the US Senate seat from the state. Pramila Jayapal won the Congressional seat from Seattle to enter the House of Representatives, the first Indian-American woman to accomplish this feat. Jayapal entered the US Congress on her maiden try. Born in Chennai, she left India at the age of five for Indonesia, Singapore and eventually for the US. Raja Krishnamoorthi was also elected to the House of Representatives. Ro Khanna, a Democrat and former U.S. Commerce Department official whose parents emigrated from India, also won a Congressional seat in California. Ami Bera was elected for a third successive term which makes him the longest serving Indian-American Congressman ever. In spite of being a Republican critic, Nikki Haley was Donald Trump's choice as US ambassador to the United Nations. Trump's nomination of South Carolina's 44-year-old governor, Nikki Haley, as US ambassador to the United Nations will be seen as a sign that he is ready to broaden his political base. This cabinet ranking post ensures that Haley will become a powerful figure in world diplomacy.In this role, she will advise the White House on foreign policy issues and represent the US in discussions with other countries. The daughter of Indian immigrants and the first woman tapped for Trump's cabinet, Haley will also inject a measure of diversity in a group that until now has consisted solely of white men. President-elect Donald Trump also selected another Indian-American, Seema Verma, for a high-level post in his administration. Verma, who has worked closely on healthcare with Vice President-elect Mark Pence in Indiana, will be the Administrator of the Centers for Medicare and Medicaid Services, overseeing government health insurance programs. Since Medicare provides insurance for over 46 million retirees and senior citizens and Medicaid, which covers the poor, has about 60 million people enrolled in it, Verma's work will have a considerable effect on the success of the new administration. "I look forward to helping him tackle our nation's daunting healthcare problems in a responsible and sustainable way," Verma said after Trump's announcement. Registration for youth and young professional - Gratis. 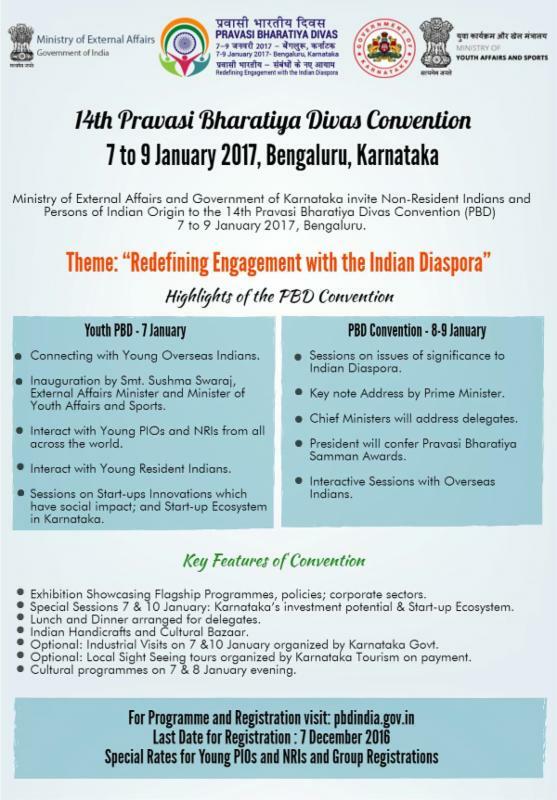 Register by sending a e-mail to Geroge Varghese at geevarghis@gmail.com. The 7th annual "Caring & Sharing" event of GOPIO Sydney North West chapter was held on November 19th, 2016 at Bowman Hall, Blacktown (Sydney). 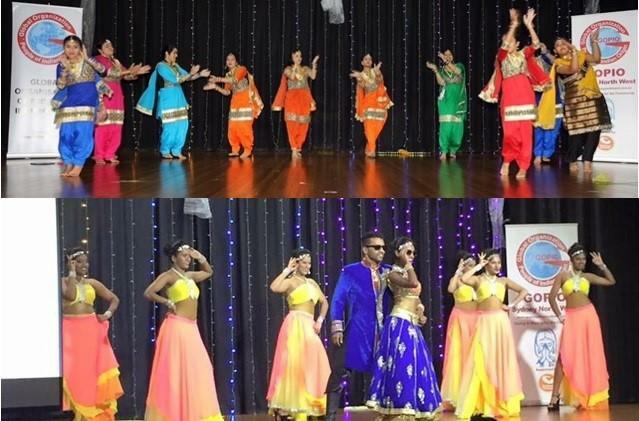 GOPIO Sydney North West Chapter team has been conducting Caring & Sharing events for the last 7 years, raising much needed funds for the less privileged in India and Australia. The chapter has also supported the victims of Fiji cyclone and Nepal earthquake. The GOPIO Sydney North West Chapter President, Prof. Balkar Singh Kang and his team - Sumit Joshi, Baljit Pelia, Parmjit Multani, Harmohan Singh Walia, Aman Singh, Neeru Singh, Amrit Buttar, Tia Singh, Sanjeet Hooda, Baljinder Singh and Ravi Singh have worked passionately towards the success of the 7th Caring & Sharing event. Such events are a result of the spirit, we all have in us to care for the less privileged. Therefore, the funds raised through these events become a symbol of hope for the needful. Photo: GOPIO-Sydeney NW team 2016 from L - R: Aman Singh, Amrit Buttar, Raj Singh, Sanjeet Hooda, Sumit Joshi, Paramjit Multani, Harmohan Walia, Prof. Balkar Kang, Ravi Singh, Baljit Pelia, Neeru Singh & Tia Singh. During the night of great cause and fun unlimited, there were scintillating performances from Shyamak Davar dance group, Phulkari group, Bass Bhangra group, Vinod Rajput, Jyoti Dixit and Dhamma Yoga kids; that kept the audience at the edge of their seats. Neeru Singh and Aman Singh, in their best attire, engaged the wonderful audience through their stage anchoring. Other attractions of the night, such as quiz prizes and Facebook photo competition attracted the zeal and enthusiasm of all the guests. Generous offerings from the sponsors in Australia and the support of the dedicated individuals in India has made it possible for the team to extend a helping hand to more than 3000 less privileged primary school children in India for the last 7 years. A few necessities that will be provided again to the primary school kids are - warm clothes, shoes, socks, sports items and other basic commodities as per the requirements of the remote area schools. This year, Caring & Sharing event not only raised funds for kids in India, and also gave donations to 'Salt of the Earth Production' for a film on Indian heritage written and directed by Anita Brar, Cancer Council, Heart Foundation and Tear Australia for the righteous cause. Caringly, funds were also donated to Manmeet Sharma Alisher's family in India. Sponsors of the evening included Kewal Kalra of Kalra Group, Sumit Joshi of My Loan Expert, Surjit Rahi of Khanna Khazana, Yogesh Manav & Jasbir Kang of Auburn Sapphire Function Centre and Ravi Singh. Additional sponsors were Fred Khurana of Ray White Quakers Hills, Fortune World Tour, Bathla Group, Winning Smile Dental Surgery, Granville Cellars, Lucky 7 Stores, Gurpreet Chadha & Aman Brar of G&A Roadline, Ripudaman Gill of Gill Roadways, Sanjeet Hooda of Gain Home Loans and Parmjit & Rosie Multani. Evergreen Photography and Rao Srini captured all the beautiful moments of the event. Special thanks to Umesh Chandra, Mrs. Usha Chandra, President GOPIO Brisbane Chapter, Harmohan Walia, Associate Editor GOPIO News, Jodi McKay MP, Member for Strathfield, Hon. Julia Finn MP, Member for Granville. Hugh McDermott MP, Member for Prospect, Mr. Rajiv Kumar Vice Consul, representing Consul General of India, Sydney for their gracious presence. 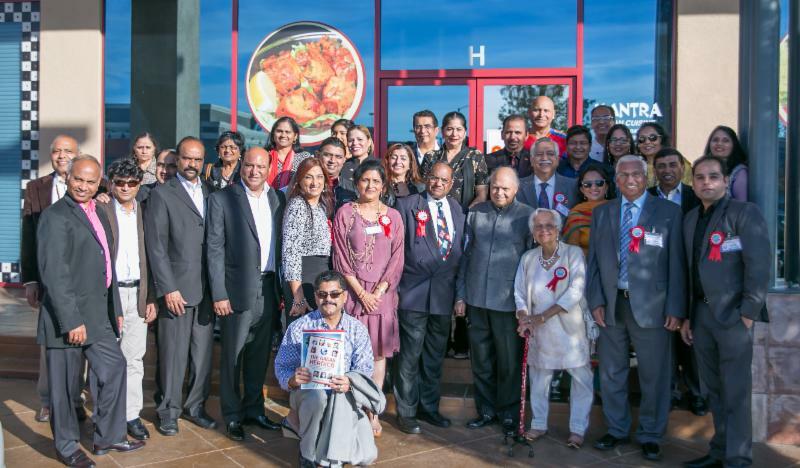 On December 4, 2016, the opening of another New Chapter, in Southern California, GOPIO-Inland Empire Chapter, was inaugurated at the Mantra Indian Cuisine in Ontario, California. At the opening were present, the GOPIO Chairman, Dr. Thomas Abraham, The GOPIO Foundation Executive Trustee Mr. Inder Singh, and the Gopio-International Treasurer Mr. Kewal Kanda. There were many supporters and Presidents and CEO of various organizations, Corporations, President of National Federation of Indian Associations, Ashok Madan, President of Chamber of Commerce in Artesia Parimal Shah, President of Rajput Association of America Rajinder Dhunna, ASEI Foundation Chairman Subba Gopavarupa, President of County of Los Angeles Indian American Professional Association Ramesh Ramnani, Executive Member of Indian Cultural Society of Los Angeles Manmohan Chopra, Executive Member of BAPS Swami Narayan Temple (Chino Hills, CA) Kanaksinh Zala, Finance Director of City of Hawthorne Rickey Manbahal, Yogesh Patel of ICS-LA, IT Project Manager Sof uperior Court of California Venkateshwar Rao Peddi, and Franchisee, 7-Eleven Stores Tarlochan Rangi, Chief Marketing Officer of ICB International Inc. Dr. Gurmeet Multani, MD, Dr. Atul Karia D.D.S of Sierra Gateway Dental Office, Madhur Shrivastav of Sunbelt Systems and Dr. Devdat Maheshwari of Vedic Temple of Montclair, Award Winning Fashion Designer Shekhar Rahate, Chair of Inland Empire IARCA Rajbir Bagga and Founder of EVP Technology & Innovation Piyush Malik. There were over 50 attendees at the Event and majority of them were from the Inland Empire Region. The Foundation Executive Trustee, Mr. Inder Singh, gave a scenario of what GOPIO Foundation is all about and the many accomplishments since the establishment of GOPIO in 1989. 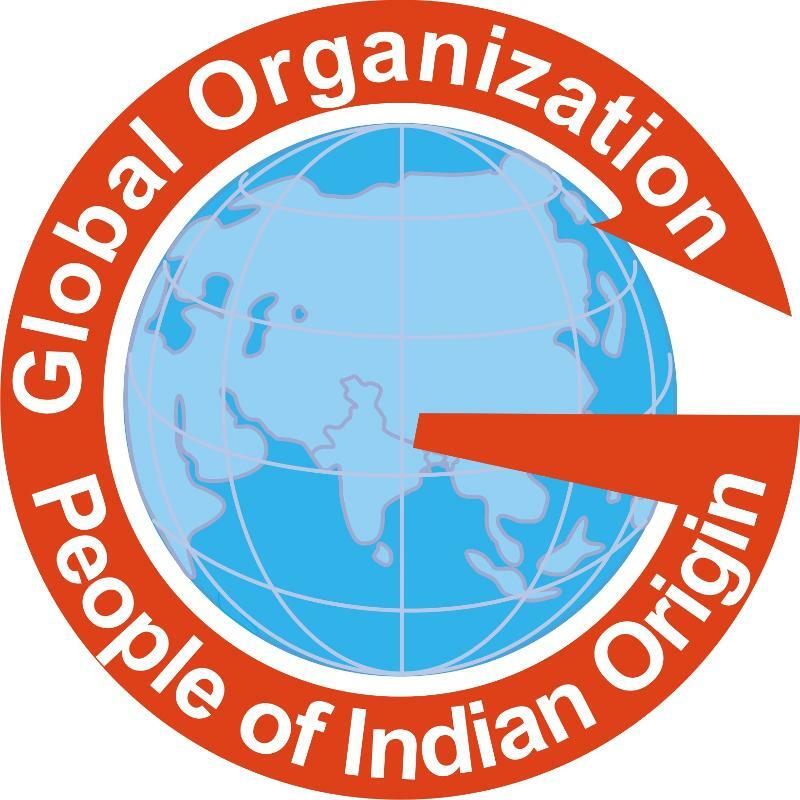 Dr. Thomas Abraham, the Chairman of GOPIO Foundation, gave the New Chapter members of GOPIO-Inland Empire Chapter, advice and explained what the goal of GOPIO International is "Think globally and Act Locally" and how GOPIO International does things differently from other Indian Organizations and is connected with the Indian Diaspora, throughout the World. He also discussed the GOPIO News Publications that reaches throughout the world. 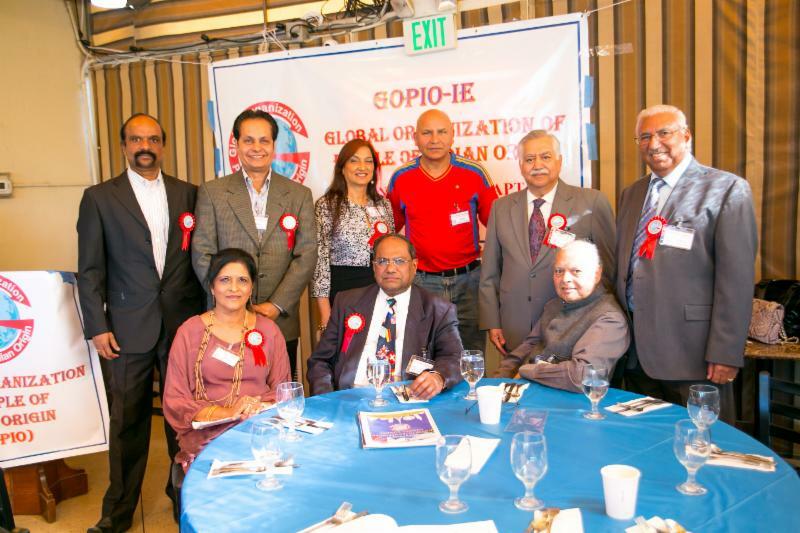 GOPIO Chairman Dr. Thomas Abraham Installed the New Gopio Inland Empire Chapter, along with Inder Singh. Ms. Vasu Pawar, shared information on the Inland Empire region of S. California, which covers approximately 27,000 square miles. All of West Riverside County, S. West San Bernardino County, and E. Los Angeles County, Cities like Pomona Valley through Palm Springs. Inland Empire has a population of approximately 4 million and in the 19th century was predominantly a major agricultural region, of Citrus, Dairy Farms, and Wine making. Now it's more of a Residential, Industrial and Commercial Development. The GOPIO-Inland Empire Chapter President, Ms. Vasu Pawar, with a background in English Literature, Education, Finance, and Information Technology, started her carrier in the U.S., as a Systems Analyst and further transitioned into Finance. She expressed that she has various projects on her mind, which address, Charity, Entertainment, Motivation and Strength to the Indian Diaspora. Life has to be better. The world is all Motion. We either move forward or backwards. There is no standing still. She urged everyone to participate in the many projects she has outlined. One of the charity projects that she specifically mentioned, is to open libraries in Villages, in Maharashtra, India, so kids from all neighboring villages could come to the library and read books covering economics, technology, science and math but not limited. She plans to duplicate that effort in other regions in India. Her plan is to have variety of books where even adults could indulge, like novels, biography, stories, magazines, reference books, and publications. It is important that we continue to establish and emphasize the value of education to the younger generation. Pawar thanked everyone for attending the opening of the GOPIO-Inland Empire Chapter, to accomplish a very important task to focus and address issues of our fellow Indians and to help each other, to bring recognition and fame to each and every Indian in our community, and to address values and principles, which guide us. Constitution Day, also known as Samvidhan Divas, is celebrated in India on 26 November every year to commemorate the adoption of Constitution of India. On this day in 1949, the Constituent Assembly of India adopted the Constitution of India, and it came into effect on 26 January 1950. The Prime Minister of India, Narendra Modi made the declaration on 11 October 2015 on laying the foundation stone of B. R. Ambedkar memorial in Mumbai that 26 November will be marked as Constitution Day. This was declared on 19 November 2015 by a gazette notification. Constitution Day is not a public holiday. In Sydney, at the Indian Cultural Centre, the Consul General Mr. B. Vanlal Vawna highlighted how the Indian Constitution came into effect. The Consul General introduced Mr. K.P. Dandapani, former Advocate General Kerala High Court followed by his address on constitution of India through live video call. Prof. Balkar Singh Kang and Harmohan Singh Walia attended the celebrations on behalf of GOPIO. A panel discussion on constitution was organised with Hon. Julian Leeser MP, Mr. Douglas McDonald and Prof. Kama Maclean. It was moderated by Ms Pallavi Sinah, noted lawyer of Sydney. The panel compared similarities between the constitutions of India and Australia. In the photo sitting L-R: Hon. Julian Leeser MP, Mr Douglas McDonald, Prof. Kama Maclean & Ms Pallavi Sinah. In Canberra, the High Commissioner of India in Australia organised Constitution Day on 26 November at the office of the High Commission of India, 3, Moonah Place, Yarralumla and GOPIO Canberra Inc attended the celebrations. Panel Discussion was facilitated by Dr. Mohan Singh with Mr. Ajay Kumar, Deputy High Commissioner on Fundamental rights enshrined in Indian Constitution, Mr. Arvind Kalia on a citizen's perspective of Indian Constitution; First Secretary, Press Information and Culture and Mr. Nachiketa Jha on Indian Constitution and Human Rights. Photo above: from l. to r.: Anil Gupta (Secretary GOPIO Canberra), Subhash Mohindra, Ravi Krishnamurti, ndian Deputy High Commissioner Ajai Kumar, Arvind Kalia & a panel member. 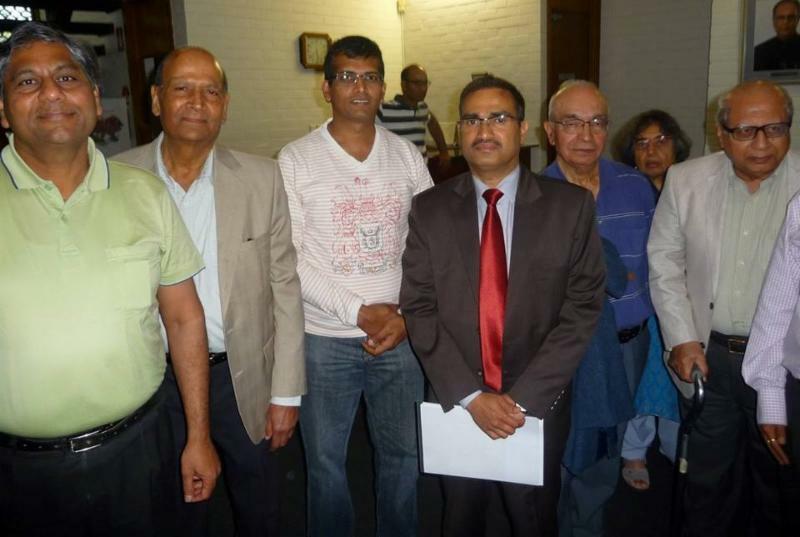 In Auckland, New Zealand, the Indian Constitution Day was celebrated at 54 Ward Street, Pukekohe and was organised by Indian High Commissioner Sanjiv Kohli. 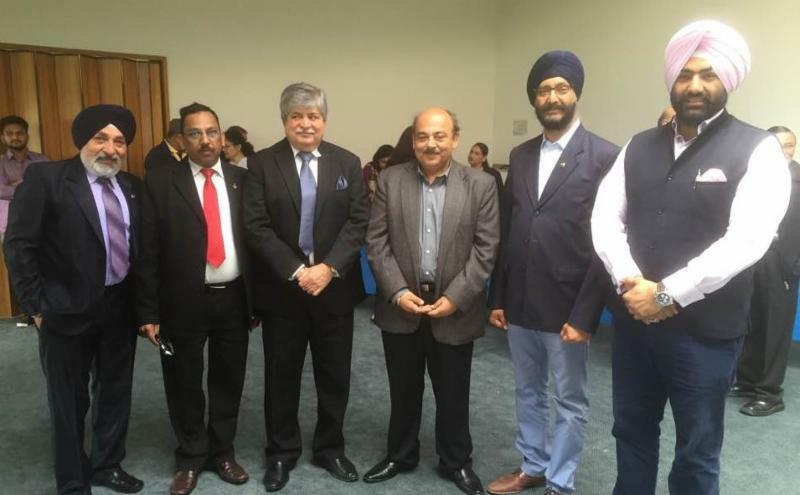 Photo Above, from Left to right Manjit Singh, Narinder Singla, Mr. Mahesh Bindra (List Member of Parliament), Indian High Commissioner Sanjiv Kohli, Mr. Kanwaljit Singh Bakshi (List Member of Parliament) & a guest in Auckland. In Hamilton, New Zealand, Indian Constitution Day was celebrated by GOPIO team. In the photo from left to right: Mrs. Aditi Podder Das (Treasurer), Mrs. Jayanti Podder (Retired teacher from India, Senior Citizen wing), Suman Kapoor (GOPIO International Coordinator) Pradeep Kapoor (President), Jaspreet Singh (Secretary), Prashant Khanna (Vice President), Tarak Shah (Asstt. Secretary, IT support). Indian-American school students won a sweeping victory in the 17th annual Siemens Competition in Math, Science and Technology last week, bagging the top individuals and team prizes, and wining three out of six national individual finalist awards and the top award in a slate of six national finalist teams. Vineet Edupuganti, a high school senior from Portland, Ore., won the $100,000 top individual prize while identical twin sisters Adhya Beesam and Shriya Beesam, both juniors from Plano, Texas, won the $100,000 grand prize in the team category. The honors were presented at the George Washington University in Washington, D.C. in which 19 high school competitors - winnowed down from an original pool of more than 2,000 - were judged on their research in topics that addressed issues ranging from Alzheimer's disease to levitating cars, and from cancer to planets outside the solar system, the Siemens Foundation announced Dec. 6. Edupuganti, a senior at Oregon Episcopal School in Portland, won the grand prize in the individual category for developing a biodegradable battery that can power ingestible medical devices that can track and diagnose conditions that affect internal organs. The Beesam sisters bagged the honor in the team category for their developing a new approach to diagnose schizophrenia earlier in patients with higher certainty using both brain scans and psychiatric evaluations. "All of the judges, including myself, were very impressed that high school students - even juniors and sophomores - were able to produce such advanced research and with an extremely sound command of the science," said lead judge Megan Leftwich, assistant professor in the Department of mechanical and aerospace engineering at the George Washington University. "There was a real passion in what the students presented this year, as was shown by the depth of their research and by the relevance to what is actually being studied and valued in academia and society today. They looked at real problems today - and all tried to go a step further in their own journey and analysis. This was a very difficult group to have to choose a winner from," Leftwich said in a press statement. Manan Shah, a senior from The Harker School in San Jose, Calif., got the $50,000 scholarship, winning the top position in individual finalist category while Prateek Kalakuntla, a senior from Texas Academy of Mathematics and Science in Denton, Texas, got the $30,000 scholarship in the same category and Pranav Sivakumar, a senior from the Illinois Mathematics and Science Academy in Aurora got $20,000. The top $50,000 scholarship in the team finalist category went to Nikhil Cheerla, a senior at Monta Vista High School in Cupertino, Calif., and Anika Cheerla, a sophomore at the same school in Cupertino. The competition is the nation's premier science research competition for high school students and seeks to promote excellence by encouraging students to undertake individual or team research projects. Three Indian Americans, Mukesh K. Jain, Samir Mitragotri and K.M. Venkat Narayan have been elected to the National Academy of Medicine. The National Academy of Medicine (NAM) addresses critical issues in health, science, medicine and related policy and inspires positive actions across sectors. NAM works with the National Academy of Sciences and National Academy of Engineering to provide independent, objective analysis and advice to the nation and conduct other activities to solve complex problems and inform public policy decisions. Mukesh Jain is the chief scientific officer at Harrington Discovery Institute, chief scientific officer at the University Hospitals Health System, chief research officer at University Hospitals Harrington Heart and Vascular Institute, the Ellery Sedgwick Jr. He is also the chair at the Case Cardiovascular Research Institute and a professor at Case Western Reserve University School of Medicine in Cleveland, Ohio. Jain has a Bachelor's degree from the University of Buffalo and a medical degree from the University of Buffalo School of Medicine. He served as a medical intern and medical resident at Beth Israel Hospital in Boston, Mass., and a chief resident at the Brockton/West Roxbury Veterans Administration Medical Center in Massachusetts. Mitragotri is the Duncan and Suzanne Mellichamp chair professor in the chemical engineering department at U.C. Santa Barbara. Mitragotrihas a Bachelor's degree from theInstitute of Chemical Technology, Mumbai and Master's and Doctorate degrees from the Massachusetts Institute of Technology. He has published more than 200 works, and has invented over 100 patent/patent applications. In 2015, he was honored as a Thomson Reuters Highly Cited Researcher. VenkatNarayan is director of the Emory Global Diabetes Research Center and professor of epidemiology and medicine at Emory University's Hubert Department of Global Health, Atlanta, Georgia. He has served as the chief of the Diabetes Epidemiology and Statistics Branch at the U.S. Centers for Disease Control and Prevention and led a number of large U.S. national epidemiological, health service, intervention and economic studies. He is a Fellow of the Royal College of Physicians of Ireland, Fellow of the Faculty of Public Health Medicine, U.K., Fellow of the American College of Physicians and Fellow of the American Heart Association. Prabhat Jha is a professor of global health and epidemiology at the University of Toronto in Toronto, Ontario, Canada. Jha studied medicine at the University of Manitoba and earned his D.Phil. from the University of Oxford. He currently serves on the editorial advisory board for the Demography India Journal and is on the board of directors at the University of Toronto Schools. "These newly elected members are outstanding professionals who care deeply about advancing health and healthcare in the U.S. and globally," said National Academy of Medicine president, Victor J. Dzau in a statement. "Their expertise will help our organization address pressing health challenges and improve health, science, and medicine for the benefit of us all." Buddhdev Pandya MBE, Director of British Association of Service' was honoured with The EMBRACE AWARD 2016 and was presented at the British Physicians of Indian Origin (BAPIO) by a national Health and Social Care Network on 29th October, 2016 at the Senet House, University of London. The event organised by the national BME Network was attended by the High Commissioner for Trinidad and Tobago and CEOs and Medical Directors of many trusts and other dignitaries. Others who were also recognised in various categories were leaders of communities, nurses, NHS Trusts and Regulatory bodies such as CQC. Pandya who had helped to found one of the national and most influential India doctors' body in the UK received the prestigious award in recognition of his 'Lifelong Service' to Health and Social Care. Pandya, who has served BAPIO for almost two decades which was step for supporting the doctors in difficulties. Mr Pandya currently is Director of Policy and Promotion and holds additional brief as Director for BAPIO Training Academy. He was involved in establishing a unique initiative - Medical Defence Shield and became its Deputy CEO to develop its infrastructure. He has campaigned for many health care awareness initiatives and initiated a number projects including, an Indian Community Centre, a mental health home for black youths, Asian centre for elderly and women refuge and welfare care centres during his forty years of contribution to the public life. Maanasa Mendu's innovation "Harvest" won her the prestigious America's Top Young Scientist award, along with a prize of $25,000. Harvest is a bio-inspired energy device that captures energy in the form of wind, rain and sun and converts it to power. This innovation was inspired by a visit to India where she discovered that many people lacked basic necessities, such as clean water and lighting. Mendu is a ninth-grader at William Mason High School in Mason City School District and her scientific thinking reflected the competition's goal of applying science to everyday life by creating solutions to improve lives and strengthen communities around the globe. Since its inception in 2008, the Discovery Education 3M Young Scientist Challenge has awarded hundreds of thousands of dollars in student prizes and paired students with world-renowned scientists to give them real-world insights and experience. During the past three months, Mendu and the other nine finalists worked with 3M scientists to develop their personal inventions as part of a unique summer mentorship program. Under the guidance of Margaux Mitera, a 3M senior product development engineer, Mendu advanced her idea from a concept to a physical prototype. As America's 2016 Top Young Scientist, Mendu is one of her generation's best and brightest scientific minds. With her innovative spirit, humble attitude and amazing drive, she is sure to make an impact on our world. On December 6, 2016, South San Francisco Council members nominated and voted Pradeep Gupta as Mayor and Liza Normandy as Vice Mayor. Gupta served on the city's Planning Commission for three years, before being appointed to the city council. Gupta has been a mainstay in the biotech industry, specializing in the area of energy efficiency and long-term planning of electric utility systems. For more than three decades he has worked with electric utility industries, such as Systems Control Inc., Southern California Edison, Electric Power Research Institute, Decision Systems Inc., and Synergic Resources International. Gupta has a Bachelor's Degree from IIT, Chennai and a Master's degree and a Ph. D from Purdue in Electrical Engineering. Five Indian-Americans figure among America's 400 richest people, in a list again headed by Microsoft co-founder Bill Gates, according to the survey by Forbes magazine. They are Symphony Technology founder Romesh Wadhwani, co-founder of outsourcing firm Syntel Bharat Neerja Desai, airline veteran Rakesh Gangwal, entrepreneur John Kapoor and Silicon Valley angel investor Kavitark Ram Shriram. Wadhwani is 222nd on the list with a net worth of $3 billion. He is the chairman of Symphony Technology Group that controls data, technology, healthcare and analytics companies. Desai's company Syntel generates over $950 million and Desai ranks 274thwith a net worth of $2.5 billion. Aviation entrepreneur, Gangwal is ranked 321st on the list with a net worth of $2.2 billion. He is the co-founder of InterGlobe Aviation, which operates the budget airline,IndiGo. Kapoor, who ranks 335th on the list with a net worth of $2.1 billion, is the chairman of two drug companies - Akorn, which specializes in "difficult-to-manufacture" prescription drugs and Insys Therapeutics, which produces an opioid for cancer patients. 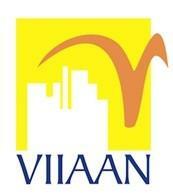 One of Google's early backers, Shriram ranks 361ston the list with a net worth of $1.9 billion. Since 2000, he has been investing in young technology startups through his firm, Sherpalo Ventures. How do NRIs living in US/Canada/Australia/Japan/Singapore change their old currencies which are no longer valid? Answer: NRIs would personally need to exchange the notes in India or authorise someone to do it for them. The foreign branches of Indian banks, both public and private sector, are not accepting cash outside the country. If you are travelling to the country any time before the 30 December deadline, you can exchange or deposit it in your NRO account. If you are travelling to the country between 02 January and 31 March, you can visit any of the specified offices of the RBI along with the required documentation and exchange the notes. If you have the banknotes in India, you may authorize in writing enabling another person in India to deposit the notes into your bank account. The authorized person has to come to the bank branch with the notes, the authority letter given by you and a valid identity proof to deposit the money on your behalf. If the money is with you abroad, you can send the money across to India through someone trustworthy and authorize them to deposit it on your behalf. Can NRIs deposit all their cash in NRO accounts? Will it be taxable? Answer: The NRIs can deposit their cash in the NRO accounts. All cash deposits of more than Rs2.5 lakh to a bank account until 30 December will be reported to the tax department by banks. It will then be matched with the depositor's income tax returns and suitable action taken. Can Indians currently travelling to foreign countries exchange old denominations for the local currency, as they have no other source for exchange? Answer: Those travelling abroad will have to wait to return to India before they can exchange their notes. For now, they will have to use debit and credit cards, travelers cheques, etc. to buy local currency. What will happen in Nepal, where Indian currency is used? Can the government impose their policies on cash holders in another countries? Answer: The Indian government is within its rights to demonetise the currencies. I'm sure the government will make provisions for the exchange of these currencies in countries where Indian currencies are legal tender. However, this will take time as some of these places are suspected hot-spots for fake currency entering the country and any exchanges happening need to be monitored carefully.